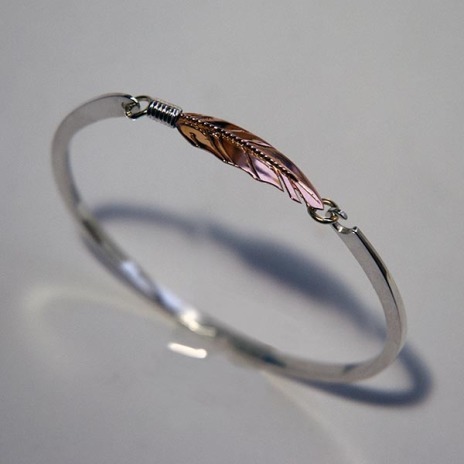 Type: Hand-hammered latch bangle bracelet provided with a flexible “hook-on” clasp comprised of a stylized eagle feather. NOTE: Prices are indicative and depend on the current gold and silver prices, the current EURO/DOLLAR exchange rate, and the bracelet size. This bracelet was hammered to its shape from round precious metal wire. The shape and title of the stylish ladies’ bracelet (the image to the left displays the bracelet executed in 14K yellow gold) suggest ‘movement’ and ‘flight’. 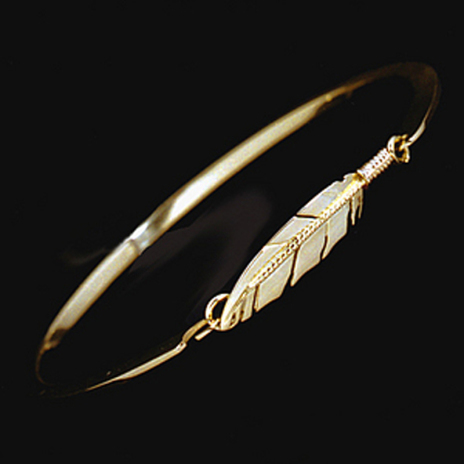 The stylized eagle feather fastening of red gold mounted on the top of the silver bracelet functions as a flexible hook latch. The feather symbolizes something that could be called ojichaag bimisewin or “Spirit Flight’: the spiritual journeys the human mind is capable of. Spirit Flight is a special and often elusive dimension in our existence, and in the old days the Anishinaabeg used to put it into practice through a variety of ritual means. One of these means was the ceremony of GIIZHIG-INAABANDAMOWIN or ‘sky dreaming’. The story of the bracelet is about a Sky Dreamer, walking on the road of consciousness and undergoing a dream vision of flight. The stylized wing feather of Migizi, the bald eagle, transports to the Sky the dreamer’s prayer, eagle fan in one hand, tortuoise rattle in the other. The feather and the rhythmic sound of the rattle carry the dreamer’s jichaag (spirit) upward, soaring and circling in a sacred blessing and accompanied by the smoke of asemaa and wafts of cedar, sage, and sweet-grass, upward through space and time, crossing freely from the past to present and moving into the future, upward beyond moon and sun – and, ultimately, even beyond the stars of jiibay-miikana, the trail of souls (the Milky Way). "All Around The Sky We Are Soaring like the Eagles." The stars will hear you. Here, in this magic place high above the sun and the moon and the stars, the Sky Dreamer experiences the essence of waawiyekamig bezhigwendamowin: the unity and conformity of universal thoughts and knowledge. 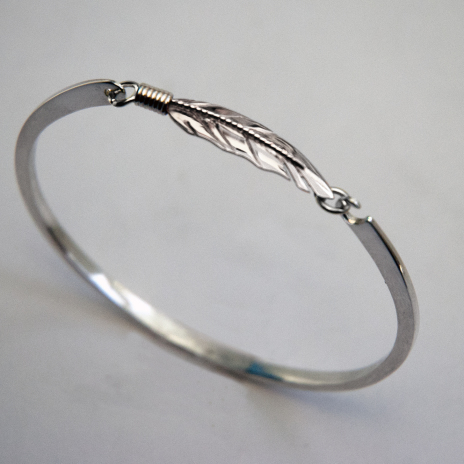 The purpose of Sky Dreaming as symbolized in this elegant eagle feather bracelet is twofold. As if the dreamer were a soaring eagle, the ceremony of sky dreaming allows his or her spirit to take flight and reach waaseyaabindamowin (enlightenment and higher levels of consciousness); it also enables the dreamer to see from high above the sacred path he or she walks on earth. It is from this sacred place high up in the sky that gidakiiminaan, the relationship and the moral responsibility that the dreamers have to the earth and a correlation with other humans and other beings of the Universe become clear through their inendamowin (mind), wiiyaw (body), ojijaag (soul/spirit), and ode'imaan (heart). From up above, Sky Dreamers see themselves and their relatives clearly and the Earth beneath as sacred and alive. The dreamers know that a new life will begin at sunrise. As they travel on the path of life they will continue to grow on that long and winding path of self-discovery and establish a lasting relationship with all relatives, corporeal as well as the incorporeal who dwell on and above and below and beyond the earth, acknowledging their moral responsibility for the well-being of the seven generations to come. On a personal level, Sky Dreamers will live with integrity and self-discipline and humbly, without pretense. He or she will succeed in any goal they set for themselves and overcome life’s obstacles as best as they can.